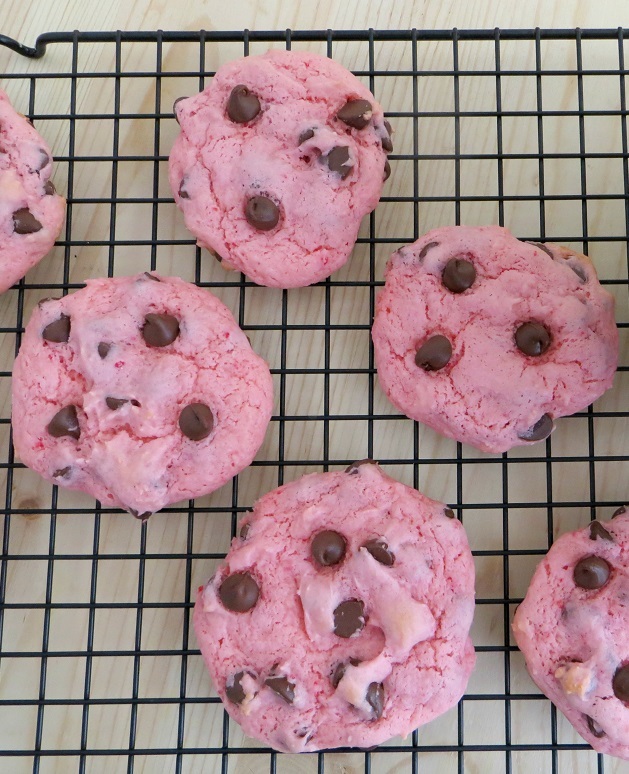 Delicious and easy to make strawberry cookies with the delightful addition of chocolate chips. 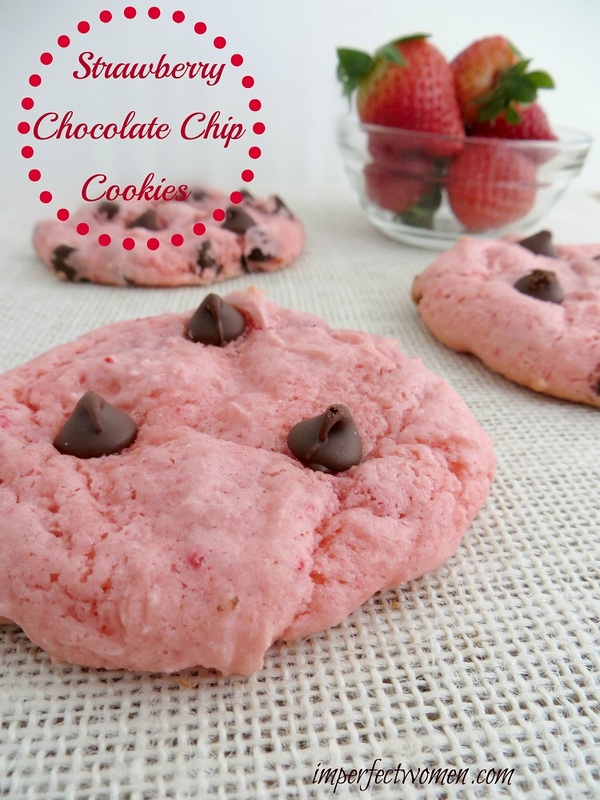 Valentine’s Day is around the corner and these Strawberry Chocolate Chip Cookies will add a perfect touch to this sweetheart of a day! These cookies are a cake mix cookie that deliver just the perfect combination of strawberry and chocolate flavor. The recipe is very simple and easy to make and no one will ever know that you used a cake mix! There are some of you out there that might not be fond of using boxed mixes in making cookies but the Strawberry cake mix really delivers the flavor without being overpowering. It also gives the cookie a great thick consistency but still are soft and light. 1. Preheat oven to 350°F. Line baking sheet with parchment paper and set aside. 2. 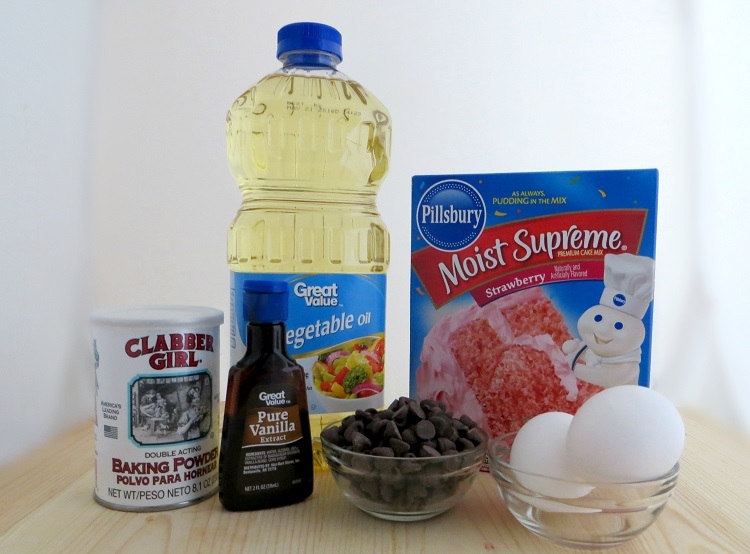 In a large bowl, mix together the cake mix and baking powder. Set aside. In a smaller bowl, whisk together the eggs, oil and vanilla by hand. Add the egg mixture to the cake mixture and stir to form dough. Stir vigorously until all of the pockets of dry cake mix are gone. Gently mix in the chocolate chips. 3. Drop rounded balls of dough (about 2 tablespoons each) onto prepared baking sheet. Place a few more chocolate chips on top of the cookie dough balls if for looks, if desired. 4. Bake for 10 minutes – do not let the cookies get brown. Allow to cool on baking sheet for 3 minutes; they will be very soft at first. Transfer to a wire rack to cool completely. 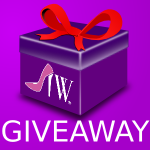 Store in an airtight container for up to one week. Two tablespoons of dough is just about right for these cookies but you can make them any size you want. You will just have to adjust the baking time accordingly. Although these cookies would be great to serve this Valentine’s Day, they would make a great spring or Easter cookie too! Bake for 10 minutes – do not let the cookies get brown. Allow to cool on baking sheet for 3 minutes; they will be very soft at first. Transfer to a wire rack to cool completely. Store in an airtight container for up to one week. I love these so much. Not just that they are my favorite color, either – they sound amazing. I am amazed right now! I’ve never known you can make cookies out of cake mix. These look great and I am still bewildered. These cookies are so festive for Valentine’s Day. I love their colors and how sweet they must be. These are so cute! I will have to make these with my daughter. Those look so delicious! Chocolate and strawberry are a great combination! Well don’t these just look super yummy! I love berries and chocolate, add the cookie- even better! These cookies look perfect! I’d love to make a batch of these for Valentine’s Day! These look so good! They would be perfect for a Valentine’s party or treat too. Interesting cookie idea. I like it. Strawberries and chocolate chip cookies….2 of my very favorite things. I HAVE to make these, thanks! These look so good! Love that they are pink too. Yum I will have to try these!! This is such a creative idea to make special Valentine’s cookies. I would definitely love a few of these! How clever is this!!! I never thought to use a cake mix to make cookies. Love the color and can only imagine how great these cookies taste! I love how these cookies look, such a beautiful pink color and I am such a big fan of anything strawberry flavored! What a cute idea! Perfect for Valentine’s Day treats! These would be fun to make for Valentine’s Day. I love that they’re from a cake mix! I’ve never made cookies out of a boxed cake mix before. That’s pretty neato! Wow! It looks so yummy and different and pretty – so wish I had this recipe when I was a Conference Center Director – would have been even more fun! Those look pretty amazing. Perfect for Valentine’s Day. Omgosh these look amazing. I am totally going to have to use this recipe. Oh my! This is just cute and my first time to see a pink cookie haha! Love it! These pretty pink cookies look so good. I’ve never had strawberry cookies before! These look really tasty and pretty! Thank you for sharing. This sounds like a great, fast treat after school! How unique! I wonder why I never thought about this before. I think I’ll have to try this out! Thank you for sharing! These look absoluate scrumptions! And all my favorite ingredients, too! These cookies look good . I’m going to make a batch for my granddautgher. She loves chocolate chip cookies and anything strawberry. These are so nice – the best use of a cake mix yet! I want to try this, and you know they will disappear fast – better make a double batch! I most definitely would love to try the Strawberry Chocolate Chip Cookies. I think it is a fine plate, of which I am going to try out later in the week. These look so good! I am going to have to make these for my fiancé. These sound really good. Two of my favorite things in one! I’ve never tried making cookies with a cake mix. I like how easy it is and I do like strawberry flavors. These cookies are so pretty and look easy to make. I am going to give them a try soon.